Line Followers are a tried-and-true type of robot; both hardware and software need to be doing their job in harmony in order to be successful at a clearly defined physical task. 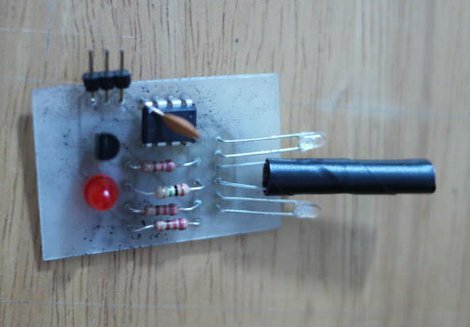 But robots don’t always have microcontrollers and software, as [Mati_DIY]’s zero programming analog line follower demonstrates. For readers used to seeing a Raspberry Pi or Arduino in almost everything, an analog robot whose “programming” exists only as a harmony between its discrete parts can be an eye-opener as well as an accessible project. A video of the robot in action is embedded below. [Mati_DIY]’s design uses two CNY70 reflective sensors (which are essentially infrared emitter/phototransistor pairs) and an LM358 dual op-amp. Together, the sensors act as two near-sighted eyes. By using the output of each sensor to drive a motor via a transistor, the presence or absence of the black line is directly and immediately reflected by the motion of the attached motor. The more black the sensor sees, the more the motor turns. Electrically, that’s all that happens; but by attaching the right sensor to the left motor and the left sensor to the right motor, you get a robot that always tries to keep the black line centered under the sensors. Playing with the spacing of the motors and sensors further tweaks the performance. Building line following robots is fun and easy. Building a line-follower that is this tiny is a different story. The surprising thing for us is that despite how it looks, this robot whose name is Rizeh doesn’t use wheels to get around. [Naghi Sotoudeh] built the line-follower using two vibrating motors, with needles (not shown above) making three points of contact with the ground. His website is a little sparse, but hit the downloads page to get a PDF file that serves as the build log. We also downloaded the 32 second demo video which is worth it. The magic-marker track that the bot is circumnavigating isn’t any bigger than the palm of your hand! Onboard the diy PCB you’ll find two GP2S04 IR reflectance sensors which detect the black line on a white paper. The power-up sequence spends a few seconds calibrating these sensors. Speaking of power, [Naghi] went with a lithium polymer cell from a Bluetooth headset. 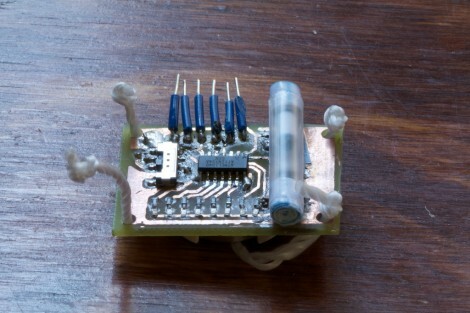 At the heart of it all is an ATtiny45 which uses its hardware PWM capabilities to drive the two motors. Of course line-followers rank up there with self-balancers as our favorite robot projects. But by far the ones we love the most are the speed-run maze solvers. 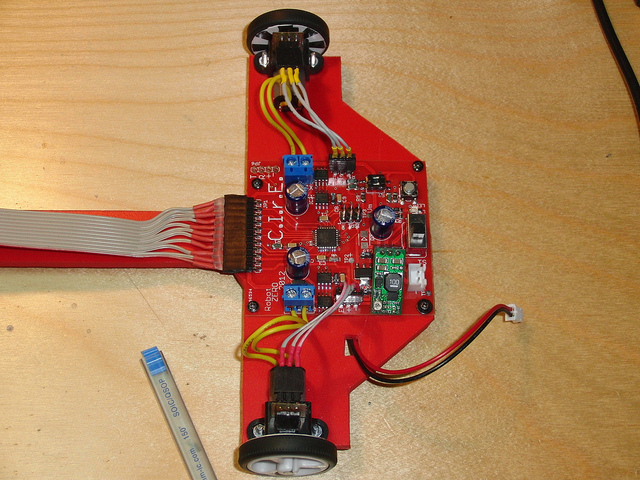 [Sebastian Steppeler] has been hard at work on his optical sensors for an electric piano. When we looked in on the project back in October he was testing reflective sensors to increase responsiveness and MIDI data resolution for his electric keyboard. 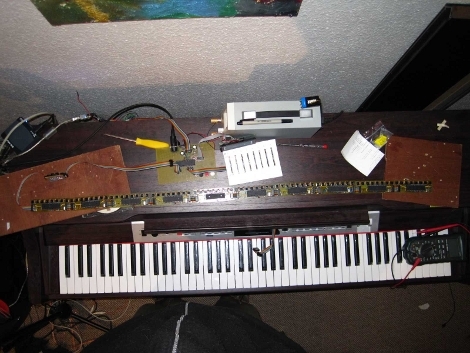 Since then he’s finalized the sensor circuits and produced enough boards to monitor all 88 keys on this full keyboard. You can see the string of PCBs just above the ivories, waiting to be installed. Not only are then in, but he also added sensors for the pedals. Because the boards were installed by hand, there are some variances in the physical placement. This can have a rather dramatic effect on the readings from the reflective sensors so he has been working out a method of balancing the calibration. Part of this is already being taken care of by the C# interface that he wrote for a PC. Take a few minutes to check out all of his blog posts, then jump down after the break and hear how great it sounds.